Valparaiso (Agenzia Fides) - The theme of the Gospel verse "Rise, pick up your mat and go home" (see Mk 2: 1-12) for the X Course of formation for catechists with disabled people took place in Valparaiso from 25 to 27 January, and was attended by 40 catechists, representatives of 14 dioceses and 5 district vicariates of Chile. According to information released by the local Church, sent to Agenzia Fides, "inclusive catechesis" is a challenge for the Church and is also a sign of the times of today, "because it calls us to break with some ecclesial structures and dynamics, it invites us to walk towards an open and willing Church to recognize in each person the face of Jesus himself". At the same time a specific preparation and training of catechists who take care of people in a situation of disability is necessary, so that they can carry out an adequate service. The catechists in fact work with children, young people and adults with disabilities, after having trained from a pastoral and professional point of view, acquiring the necessary skills for this service. 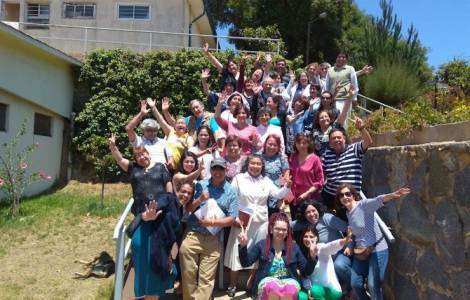 In some Chilean dioceses Teams of inclusive catechesis dependent on the diocesan catechetical Commission, have been trained.